One of the key aspects of the commemoration of the dead (also known as memoria) in medieval Europe is mentioning the deceased's name in prayer or during a memorial service. These prayers and masses, that intended to benefit the soul of the deceased in purgatory, were often carried out on a yearly basis on the anniversary of the person's death. Since the Middle Ages these intercessory prayers were carried out by thousands of monks and priests. In order to perform these duties many institutions created documents, mainly calendars and registers, in which the names of the deceased that had to be commemorated were recorded. For the last fifty years research of these memorial sources, as well as the study of other aspects of memoria, has been an important aspect of medieval studies. It resulted in various studies, research projects, and editions of memorial sources. Il 'Liber defunctorum' della certosa di Firenze is one of those editions, which is interesting especially for specialists of memoria, and / or the history of the Carthusian Order. It contains the Liber defunctorum (book of the dead) from the Carthusian monastery (charterhouse) of San Lorenzo a Monte Acuto near Florence. In this Liber defunctorum the names of the persons who had to be commemorated were registered. It lists inhabitants and benefactors of the Florentine charterhouse, but also Carthusians and benefactors of other European charterhouses. The text is enriched with a large body of mostly unpublished archival material concerning the Florentine charterhouse. Therefore, the book gives an insight into the history of the reclusive order of the silent monks, and of the Florentine charterhouse in particular. It covers six centuries of the monastery's history: from its foundation in 1342 until 1957, when the monastery ceased to exist and was transformed into a Cistercian monastery. The book includes several unique photographs of the interior of the monastery, and of portraits of the Carthusian monks and lay brothers from the late 19th century. The Carthusian order originated in the late 11th century as a reform movement, with no direct intention to become a religious order. Bruno of Cologne, the founding father, simply wanted to live as a recluse with a few followers and devote his time to contemplation and prayer. However, during the later Middle Ages the Carthusian order became renowned for its austerity and purity, which led to the common belief that its intercessory prayers were the most effective for shortening the stay in purgatory. Consequently, the Carthusian order attracted many wealthy benefactors who in return expected the monks to pray for their souls. As a result, the order's growth accelerated in Europe in the 14th and 15th century. In Tuscany several charterhouses were founded in the first half of the 14th century: in 1314 the Maggiano Charterhouse was erected near Siena; followed in 1338 by the charterhouse of Farneta near Lucca; and in 1343 the charterhouse of Pontignano, also near Siena, was commissioned. A year before, in 1342, the Florentine Charterhouse was founded by Niccolò Acciaiuoli (1310-1365), a member of a Florentine banking family. He served under the kings of Naples and became the grand seneschal and count of Melfi, Malta, and Gozo. He died in Naples, but was later interred in the Florentine Charterhouse. As its founder, Niccolò was commemorated each year on the day he died (8 November), and for that reason he can be found in the Liber defunctorum. The Liber defunctorum is being kept at the archive of the still existing Farneta Charterhouse. It consists of three parts: a) the Liber defunctorum itself, containing a register (or index, as it is called) of the Carthusian monks, lay brothers and benefactors of charterhouses from all over Europe that had to be commemorated (37-648); b) a register of all the priors of the Florentine Charterhouse (649-658); and c) a table providing information on which days of the year commemorative services had to be held for the persons mentioned in the Liber defunctorum (659). The Liber defunctorum was started in 1676 and continued afterwards. Undoubtedly, this manuscript replaced an older manuscript, because there are also older entries. The earliest entries date back to the founding period of the monastery, since the eldest entry is that of Dom Benedict, a Florentine Carthusian who died 30 March 1343. The manuscript was kept until 1956, a year before the dissolution of the monastery, as the youngest entry is that of Dom Louis-Marie de Massiac who died on 3 September of that year. The persons are ordered alphabetically by first name, in chronological order on year of death. More than half of the entries (56%) concern deceased Carthusians, the other 44% are important benefactors from the Florentine Charterhouse and other European charterhouses. Consequently, among the registered persons we find popes, bishops, cardinals, canons, emperors, kings, queens, dukes, duchesses and other aristocrats from all over Europe. In total the manuscript contains 1525 persons that had to be commemorated. A brief analysis of the entries shows that most of these persons (more than 1080) died in the 17th and 18th century, while during each of the other centuries much less persons were registered (circa 100 for the 15th, 16th and 19th century; 45 for the 20th century; and only 25 for the 14th century). For each person who is registered, some biographical information is given. This information can vary from certain basic information, such as the person's name and the date of death, to more elaborate information on the person's background (status, titles, personal deeds etc.). In addition, the editor of the book, Graziano Concioni, who published previously on the religious history of Lucca, has supplemented the entries - especially those of the Florentine Carthusians - with biographical information from other sources, such as unpublished archival material from the monastery, but also from several well-known chronicles of the Carthusian Order (e.g., Chronicles by Le Couteulx and Le Vasseur). The notes often concern the persons' entry into the Carthusian order, the (administrative) positions they held in the monastery or in the Carthusian Order, special deeds of these persons, donations and notes on their deaths. In several cases, especially those of the Carthusian priors from the 17th until the 19th century, the added texts are substantial, telling a great deal about the history of the monastery. Unfortunately, in the introduction that precedes the edition, no context or source criticism is given concerning the additional archival sources that were used, such as the much quoted Libri di Partiti A and B. Therefore, it remains unclear what the status of these documents was, when they were compiled or written, or how they functioned in the monastery. In addition, most of these texts are in Italian (unlike the actual Liber defunctorum, which is in Latin). The question arises: were these texts all in Italian or translated from Latin? The introduction only highlights a few aspects of the Liber defunctorum, such as the obligation of the Carthusians to keep a calendar of the dead. Regrettably, it offers no systematic analysis of the entries, nor is any explanation given on how the table at the end of the manuscript was used. Perhaps this is something for future historians to research. 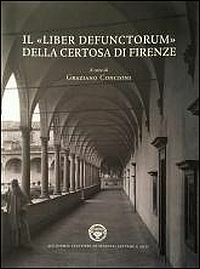 Il 'Liber defunctorum' della certosa di Firenze is predominantly a reference book (or treasure trove) for researchers. The fact that most of the texts are in Italian (and Latin), without any summary in English, will make it difficult for the book to reach a wider audience than the usual suspects of Italian-speaking local historians, and specialists in memoria and / or Carthusian history. Nevertheless, the book prevents these 1525 persons, who after the end of the Florentine Charterhouse were no longer commemorated, from fading into oblivion, and with this it remains true to the spirit of memoria. For instance, in Germany researchers such as Otto Gerhard Oexle, Dieter Geuenich and Michael Borgolte published extensively on this subject. In France the works of Jacques Le Goff and Philippe Ariès are well known. And in recent years the Dutch MeMO Project (http://memo.hum.uu.nl/database/index.html) catalogued medieval memorial source material from the Netherlands.